How can I transfer stock between warehouses? Use Inventory Planner to move inventory from one location to another using a warehouse transfer. Use the Purchase Order section to transfer stock between warehouses. You will need more than one warehouse enabled in order to create a warehouse transfer. 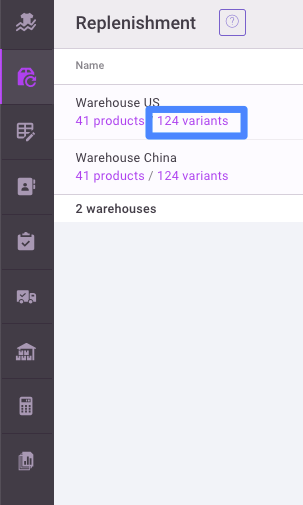 Start by clicking on Replenishment > warehouse location that will be the destination warehouse. This will show you the demand and replenishment recommendations specifically for that location. Select items that you wish to transfer. Create a new Purchase Order. In the Order Type dropdown, select Transfer. Then you can chose the origin warehouse. The next field will have you chose a destination warehouse. Add products as you normally would on a purchase order. 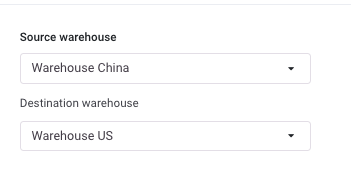 If there is not enough stock available in the source warehouse, you will be warned at the bottom of the purchase order to Fix Insufficient Stock. This will update quantities ordered to show a maximum of the stock level in the source warehouse, within the limit of the replenishment recommendation (quantities ordered will only be lowered if you fix insufficient stock). Once the stock arrives at the destination warehouse, you'll receive it just as you would a purchase order.